The four Sunday afternoon performances attracted excellent audiences, with the wonderful sight of extra seating and full houses to enjoy the production of Noel Coward’s witty comedy Hay Fever. This slot in our annual program has proved to be a popular one with audiences, with its choice of plays like Coward and other 20th century writers, and perhaps also the attraction of a Sunday afternoon performance. 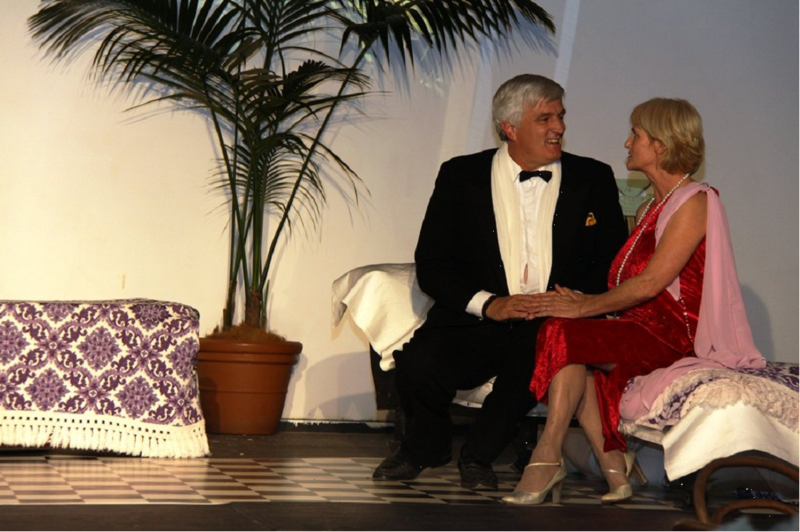 It is also important to note the introduction this year of naming rights to our major productions – with Rules Club Wagga taking up Hay Fever as its sponsored show for 2013. It was pleasing to see that special offers to Rules Club members brought in quite a number of people and so broadened our audience reach for future productions. Congratulations to the directors, Fay Walters and Clancy Arnold, cast and crew on a fine afternoon’s entertainment. Part of the appeal of Hay Fever can be seen in the setting and costuming elegance in this scene featuring Bob Hitchens and Anna Swift – a style followed through in the three acts of the production.